Clackamas County Board of Commissioners is inviting residents, business owners, elected leaders, service providers and young leaders to help identify and discuss best practices for citizen participation. The Complete Communities Congress will be held Wednesday, May 18 from 6 to 9 pm at Clackamas Community College – Gregory Forum, 19600 South Molalla Avenue, Oregon City. There is no charge for this event and refreshments will be served. Attendees will be asked to participate in discussions to identify ways to effectively communicate with the County and how the County can communicate with citizens in a meaningful and timely way. Participants will be asked to describe an experience where citizen participation worked best and to suggest best practices for citizen participation that the county should consider. The Congress is part of Complete Communities for Clackamas County, a nationally-recognized citizen engagement program that began in 1999 as a response by the Board of County Commissioners (BCC) to citizen requests for increased participation in decisions that affect their lives. Since its inception, the BCC has hosted six Community Congresses, providing an opportunity for hundreds of local officials, citizens, education and business leaders to work together on a range of issues. 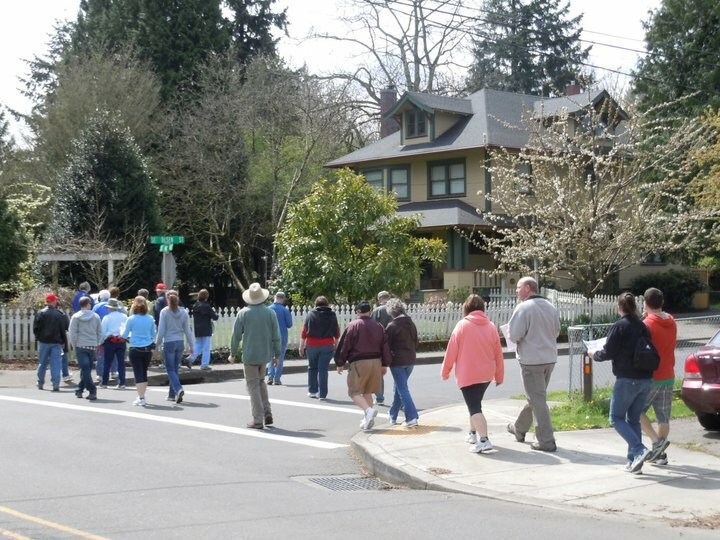 ﻿The ‘Walk Milwaukie’ series got off to an incredible start last month when about 45 residents came out to tour the Ardenwald/Johnson Creek Neighborhood. 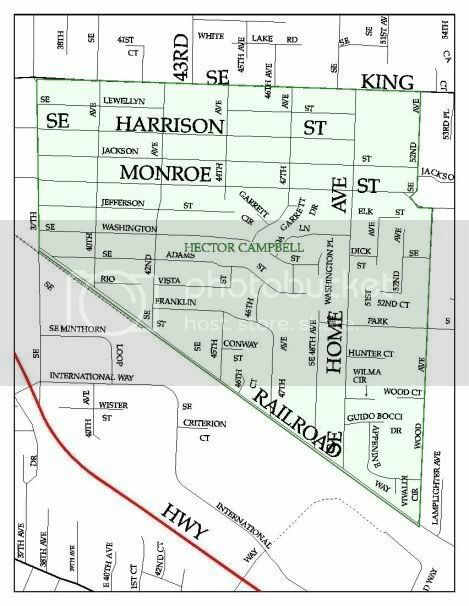 The series’ organizer, Paul Klein, hopes to build on that success at this month’s tour of the Hector Campbell Neighborhood on Sunday, May 15, at 1 p.m.
“Everybody is welcome, including well behaved dogs on leashes,” Paul explains. 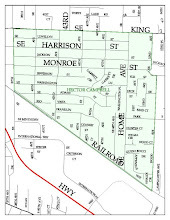 Participants should meet at Hector Campbell School for the approximately 2 ½ mile, about 90 minute, walk. 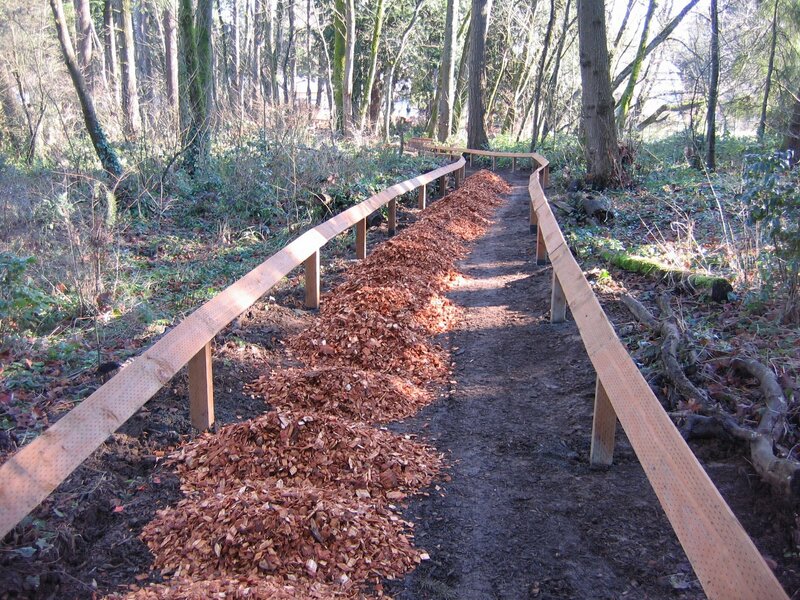 How far can Milwaukie walk? Campaign Kick-off Walk at City Hall, 6 p.m. on Wednesday, May 11th! City Liaison Report: Pat DuVal had nothing to report. There were no questions for her. Police Report: The Chief distributed April property crime statistics. The Department’s new drug sniffing K-9 officer, Shaka, this past weekend aided in her first felony arrest for drugs found in a vehicle. Chief Jordan reported on the recent firing and prosecution of one of our officers who had falsified his leave records while working on assignment with Tri-Met police. The suspicion was first reported by one of our own officers. He said he was very proud that his officers’ standards of integrity led to the prosecution, guilty plea to official misconduct and dismissal of this officer. A neighbor commented on how much we appreciate the Chief’s transparency regarding what happens with the department. A visitor from Ardenwald neighborhood raised a question of speeding traffic on King Road between 36th and 42nd. This is on the border between our neighborhood and Ardenwald’s. The Chief took note of this area for traffic analysis and the neighbor was advised to also attend Ardenwald’s NDA meeting to raise this issue. This might be worthy of consideration for a future WSMP project. The Chief described the current deployment of a loaner LED speed display sign. He plans to purchase 1 or 2 in the next fiscal year. These signs can be easily moved from one location to another. The models being considered collect data even when the speed display is not on,, so it is easy to make a comparison between when it’s off and when it’s on to determine if it is a speed deterrent. So far it is clearly working as a speed deterrent on Stanley Avenue. It does require a clear signal as it operates off the internet, so not all locations will work. There were some questions about on-going problems with teenagers misbehaving in Homewood Park. The Chief encouraged neighbors to always call either 911 or the non-emergency police dispatch number 503-786-7500 if they see something they don’t think is right. He did remind the group that unless they are drinking or under-age smoking the “suspect subjects” also have a right to use of the park within the city’s guidelines. But police will always go and determine whether or not criminal activity is occurring. Definitely if people are in the natural area off the path or in the park after dark they need to be questioned. A neighbor enquired of the Chief whether we have sufficient staffing. He said that given the nature of the city, that we have two state highways running through town that are not policed by any other agency, and the kind of calls our officers typically have, along with technological tools (such as the photo radar van) he feels we have adequate staffing. He does have a half time position in the next budget to hire an evidence and property technician. Campbell School Future Use of Buildings: Asst. Supt. Of Operations Ron Stewart and Gov’t Relations Director Krumm led a discussion about the district’s policies relating to the future use of the school. This information is available on their website. Discussion centered around future use of the fields and gyms by sports organizations (may cost more for the gym due to custodian pay requirement) and desire to have another school or a municipal or social service agency use the buildings. Comments, suggestions or queries and applications for school building use can be emailed to jkrumm@nclack.k12.or.us. The timeline for gathering community input on the future use is short – the school district will make recommendations to the Board and a decision will probably be made before July in case there is a private school that may wish to start up in September. Sarah Smith, HCNDA Parks Coordinator, asked about the possibility of having a community garden in the upper field. She was advised to submit a proposal to the school district for it. One neighbor mentioned that Milwaukie has needed a Community Center for a long time. She noted that there is no place for children and youth to go for entertainment and the Campbell school site could be ideal for such a project. There was also mention that the Portland Police Activities League had at one time mentioned establishing a youth activities center in Milwaukie. Mr. Krumm advised people to write in to propose the projects, although funding these activities could not be done by the school district. Mr. Aschenbrenner, Chair of the City’s Budget Committee, commented that it is not likely the city of Milwaukie has funding for it either. There were questions about security of the buildings once school is out. Milwaukie PD has permission to be an agent for the school district and can trespass or arrest people who commit crimes on the school property. Neighbors who view anything unusual should either call 911 or the non-emergency police dispatch number 503-786-7500. Walking the Neighborhoods – Paul Klein The second Walk the Milwaukie neighborhoods walk will be Sunday May 15th at 1pm starting at Campbell School parking lot. It will tour about 2.5 miles of Campbell neighborhood. The following month’s walk will be Historic Milwaukie’s neighborhood. He also mentioned a 3K walk commencing from City Hall at 6pm on Wednesday May 11th celebrating the Decade of Action for Road Safety, a UN sponsored global effort to reduce traffic related road deaths across the world. Mr. Klein can be contacted at arkanjl@dslnorthwest.net or 503-652-8891. Grocery Co-Op: Vince Alvarez attended to explain his idea of starting a Milwaukie Co-Op. Members would join for a currently undetermined amount of money, and the co-op would carry basic food items and locally made produce and products. The hope is to locate it near the Light Rail station so people can pick up necessities on their way home. 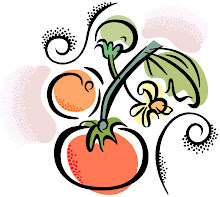 The co-op is led by a Steering Committee of members, and seeks to improve the quality and nutrition of available foods. OFFICER ELECTIONS: The current slate of officers was re-elected: Mary Weaver Chair, Linda Hedges Secretary, Sarah Smith Parks Coordinator and David Aschenbrenner Treasurer. A neighbor expressed great concern which was echoed by others regarding the process concerning the photo radar van issue. All the NDA's and PSAC supported continuing the van, and 4 of 5 Councilors agreed. When 2 of them decided to reverse their thinking, there was no discussion with all the groups that had recommended a yes vote and would have been no opportunity to give further testimony if the vote had not been postponed at the last minute. There was also no substantial new information presented that would account for why continuing the van is not in the best interest of Milwaukie citizens. It is even more concerning when such great progress has been made in cooperation and communication among the NDA's and between NDA leadership and Council, particularly around traffic safety issues and the Walk Safely Milwaukie Program. It was very surprising for all the city's advisory groups to be discounted in this way, as well as our police department. To realize it could occur with ANY issue in the city puts a real strain on our trust in city government. Mary Weaver had researched and made available a 77 page report including statistics and data in support of photo radar van operations. Campbell NDA had already voted unanimously for the van and sent a letter of support to Council in January. It was agreed that another letter of support was needed. David Aschenbrenner moved and Linda Hedges seconded a motion to support approving the contract for continuation of the photo radar van in Milwaukie as it currently operates. Vote in support: 8 for, 0 against, 2 abstentions (including Councilor Hedges who does not vote at NDA meetings). Neighbors were encouraged to contact the Mayor and Councilors to advise them of their support and to attend the May 17th Council session to show support for the van. Rick Till, a representative of the Tsunami Crew, an environmental action group active in restoration and preservation of the 3 Creeks area near Harmony Road, attended and distributed literature asking for our support in the continuing effort to stop County and Clackamas Community College plans to build an access road into CCC through the Oak savannah in the 3 Creeks natural area adjacent to the Harmony road campus. Neighbors were asked to contact County commissioners to express support against the plans. Action: Linda Hedges to write a letter from the NDA in support of “no build” option. c) Light Rail Meetings: The third Monday of each month a regular Light Rail Advisory Committee meeting is held at the Public Safety Building, 7pm. Look on the city’s website for more information. http://www.ci.milwaukie.or.us/. Now is the time to attend and be part of the input on design elements of the stations and bridge. d) Planning has commenced for the 2011 August Homewood Park Picnic. More helpers are needed!! Please contact Mary Weaver, Linda Hedges or Sarah Smith to assist. The picnic is planned for Monday, August 8, from 6:00-7:00pm. A postcard or flyer will be mailed to all neighbors. There will be a raffle again. Clackamas County FD #1’s latest newsletter is available on: http://www.clackamasfire.com/documents/communitynewsletters/ and monthly in the NDA’s email at info@hectorcampbellnda.org. Read about this meeting and other important news at our website: www.hectorcampbellnda.org. Join neighborhood volunteers spreading wood chips on the trail at Homewood Park. Refreshments will be provided. Please wear gloves, and dress for the weather. If you have a wheel barrow, PLEASE bring it! 2009 Wood Chipping in progress...it's time to add more. How much energy and money can you save? What is the single biggest energy user in your home? Do you need to install insulation or simply change your habits? Presented in collaboration with Clean Energy Works Oregon, and Energy Trust of Oregon, this workshop will teach you how energy works in a home and what impact your actions can have. You'll develop a deeper understanding of home-energy use, the effects of appliances and systems on your utility bills and how changing simple behaviors can reduce your energy and carbon footprint. You'll also learn about what you can do to increase comfort and indoor air quality, how to distinguish do-it-yourself techniques from projects that may require professional services, and understand what diagnostic testing can do for your home.